We’ve discussed in our previous post the need to reshape Performance Management so the next question is, what does the future hold? To address the shortcomings of traditional Performance Management and stay up-to-date in the contemporary business climate, organizations need to find ways of bringing real-time Performance Management solutions into their practice. These solutions need to be recurrent in nature and emphasize future achievement. Organizations that embrace Performance Management next practice are seeking to set clear expectations that are aligned with the purpose of their business. These organizations incorporate real-time feedback into their Performance Management and use ongoing conversations to discuss growth opportunities. This reflects a renewed effort to maximize employee potential in line with organizational purpose. help individuals and teams to reach their full potential. 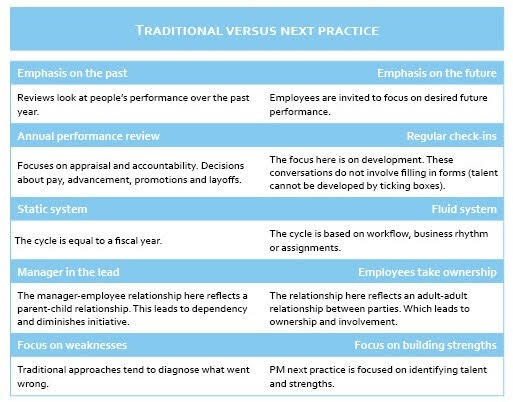 The table below illustrates the key differences between traditional Performance Management and Performance Management next practice. WHAT DOES IT TAKE TO SUCCESSFULLY IMPLEMENT PERFORMANCE MANAGEMENT NEXT PRACTICE? empowered employees who are connected to stakeholders and responsive to organizational needs (i.e. workers who are free from the restraints of excessive bureaucracy and are proactive and forward-looking). employee and manager support systems to effectively deal with the challenges of more future-oriented and flexible Performance Management. When transitioning to a new Performance Management method, organizations have made a concerted effort to transform how management operates. These changes go beyond implementation plans and focus on transforming mind-sets. Organizations have also devoted a lot of time to communicating the new approach across the organization through various channels. The power of repetition plays a significant role here. By repeating what is coming and what will be expected from people and by reiterating the benefits of the new Performance Management system, employees become familiar with this new work process and their role within it. Most organizations that have introduced ‘Performance Management 2.0’ into their business have designed HR tools to facilitate its implementation (e.g. reference guides, short videos, simple action steps, blogs). In particular, creating a central location for tools and information, an intranet, has been shown to be extremely beneficial to achieving a smooth transition from a traditional to a new Performance Management system. Finally, organizations that have adopted a more future-oriented and real-time Performance Management system emphasize the need to integrate capabilities to perform well within this system. This can be achieved by creating integrated leadership capabilities (e.g. setting clear expectations, giving timely feedback, training employees) as well as by providing coaching and training programs. What has stood out most for us in our work with performance management is the high level of consensus regarding the need for a new and improved Performance Management system. In our work, both HR professionals and business leaders have highlighted the importance of an effective approach to Performance Management. The picture that emerges is that both people and business are starting to suffer as a consequence of ineffective Performance Management processes. What’s more, we’ve seen many businesses and stakeholders display great energy and enthusiasm when it comes to discussions about Performance Management as well as a very constructive and proactive attitude. All that is needed to harness the potential of this dynamism and of positive new solutions is organizational readiness. So, our advice is clear: organizations, get ready! Nicolien Dellensen, Senior Consultant with Time To Grow Global is a behavioural and research specialist. 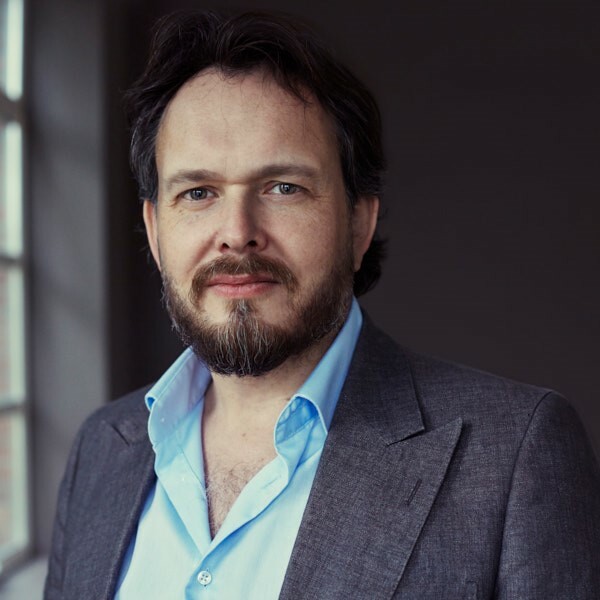 Govert van Sandwijk is Managing Partner, specialising in Strategy Facilitation, Leadership development and Organisational performance.